Transfer from your hotel to Pukapukara. village of Yuncaypata, after a short break, we will continue to another point of interest, while we enjoying the natural landscape, including streams and forests to reach the archaeological site of INKILTAMBO (inkacarcel), then a brief visit to the arqueological site, we will following the path to reach the pre-Inca archaeological site of Choquequirao, beautiful place located between a small valley in the border line between Cusco and Apurimac regions. This arqueological monument contains terraces , fountains and "a beautiful astronomical observatory". After we will continue descend until to arrive to RUMIWASI, the tour ends in the district of San Sebastian where our personal will pick you up to go at hotel. 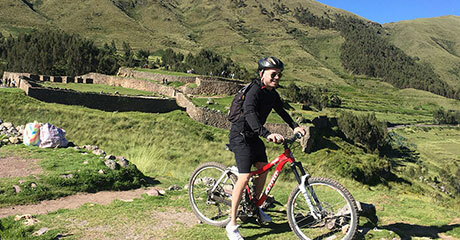 If you prefer, You can go by bike until the main square of the city.